Back when we were milking the sheep we used the fresh milk for drinking and on cereal, and we also made butter with it. Both were delicious! We were surprised because it was our first time ever milking sheep. The milk was surprisingly sweet, especially from our Lincoln Longwool, Stella. We found that we liked sheep’s milk better than goat’s milk, and even a little bit better than cow’s milk. 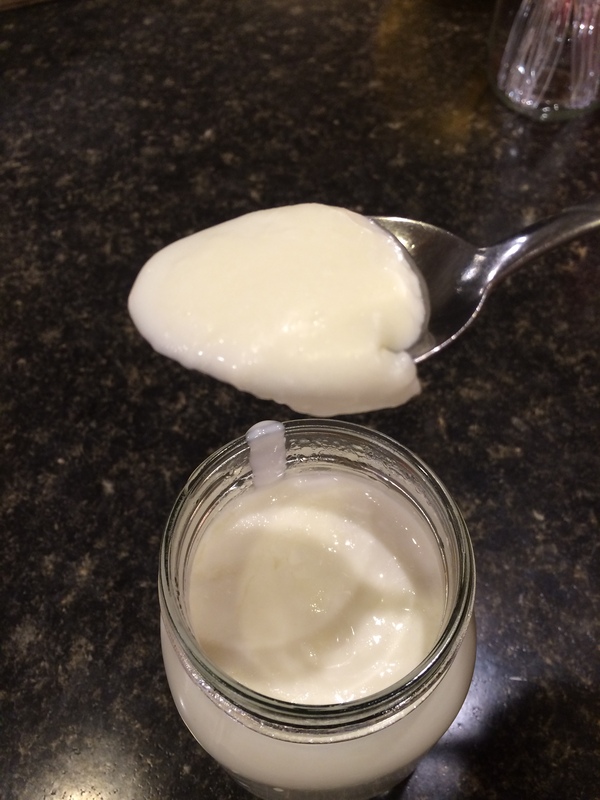 I wanted to try making yogurt with it, but didn’t have the time, so we froze some so I could try it later. This week I decided it was high time to get to that and so I took it out of the freezer, thawed it, and made it into yogurt. 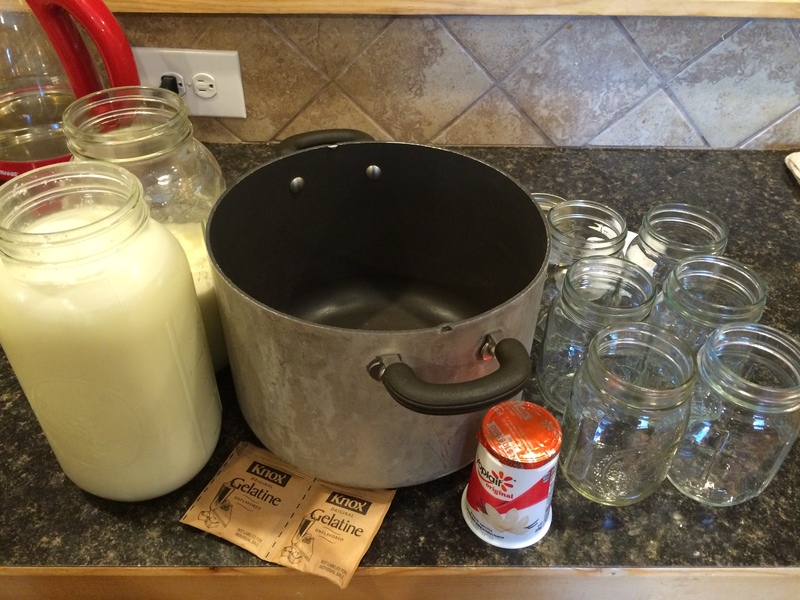 I decided to use the same recipe that I use for cow’s milk. 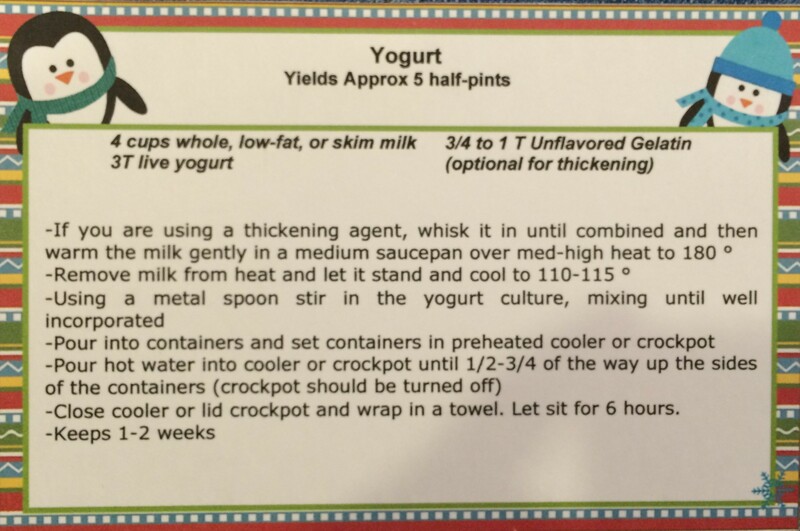 We like our yogurt thick and custard-style, so we add some gelatin to it to achieve that texture. It is optional and if you like it thinner then you just skip that step. First, pour your milk into the pot and whisk in your gelatin if you are using it. Then, start it heating gently over medium or medium/low heat, stirring occasionally. 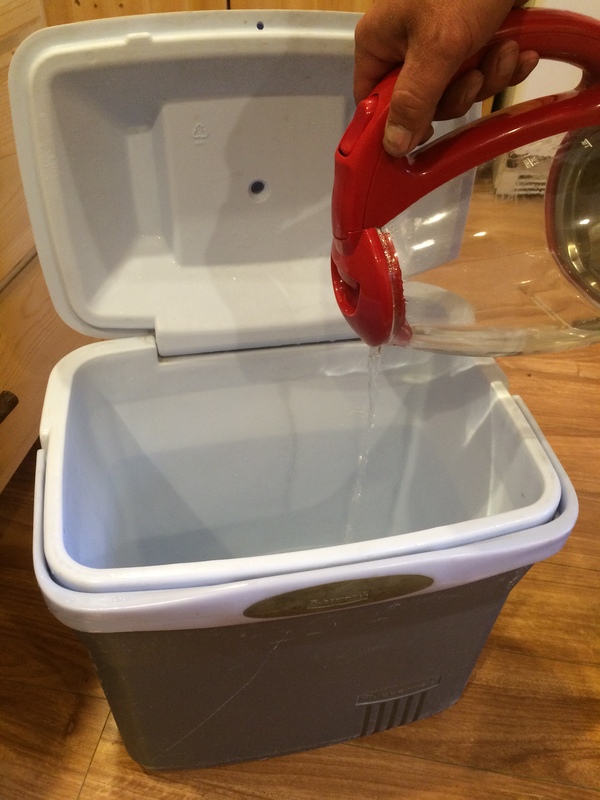 While you are waiting for it to heat, preheat your cooler by pouring about 1/2 gallon of boiling water into it. Set your jars in there to preheat too. I do not submerge my jars in the water, my cooler is small enough that if I put 6 pints in there they hold each other up on top of the water. Close the cooler. Heat to 180F degrees and then remove from the heat and let sit and cool to 110-115F degrees. I stir it occasionally while it is cooling because a crust forms on the top if I don’t. And if I am in a hurry for it to cool, I set the pot in a dish of ice water and stir the milk gently, refilling the ice water as needed to keep it cooling. 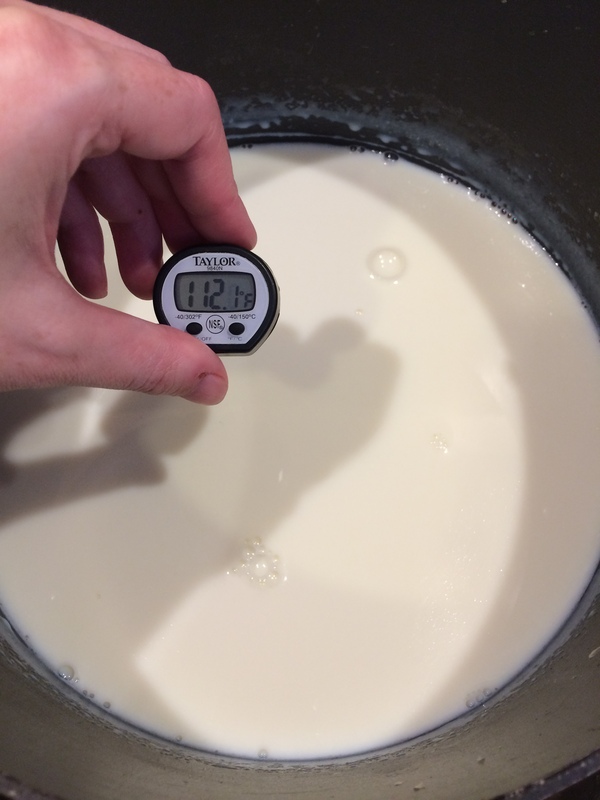 Once the milk is at 110-115F, stir in your live yogurt. Then pour into warmed jars and put lids on loosely. 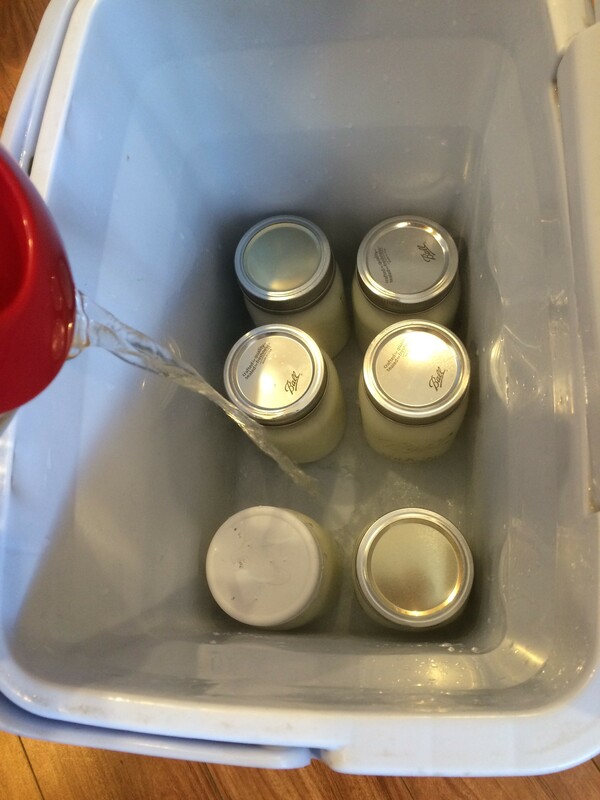 Pour the preheating water out of the cooler and put the warm, filled jars of milk into the cooler. Then pour boiling water into the cooler until it is about half to 3/4 of the way up the side of the jars. Close the cooler and wrap it in towels. 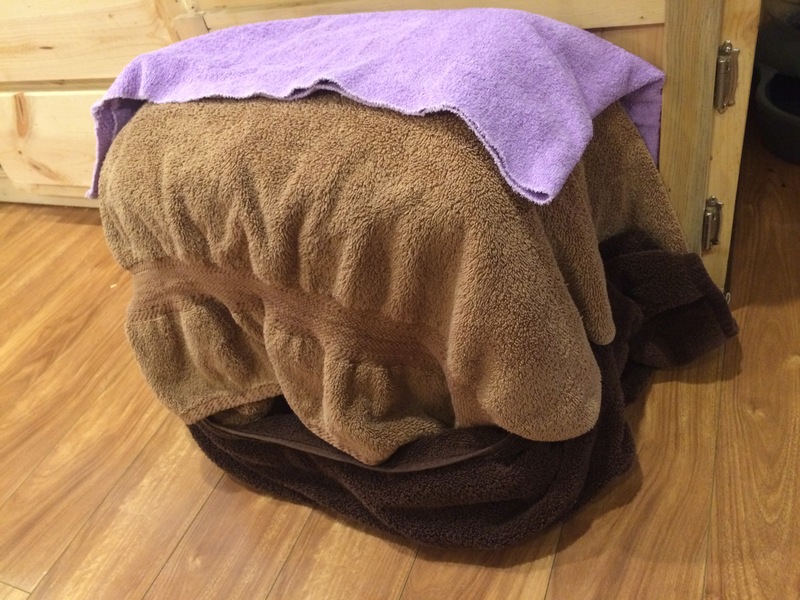 Keep it in a warm spot, undisturbed for 6 hours. After 6 hours, remove one of the jars and check the consistency and flavor. Because it is still warm, it will not be as thick as the final product will be after it is cooled. If you want it to be stronger flavored, put it back in the warmth for another few hours. Now it is done! Tighten the lids and put it in the refrigerator to cool. We enjoy it with our favorite fruit/s, granola, or oatmeal. We also like to sometimes add vanilla extract and a little sugar for flavoring. We have all been very ill for over a week now. Some sort of nasty flu virus. It has put us way behind on the homestead. Spring is not a time when there is wiggle room for being sick for days on end. We will be scrambling to catch up the next few weeks. But despite our illness, basic life goes on around the farm. The lambs are doing very well. Lily’s tail fell off, exactly 21 days after being banded. The elastrator band worked great, we will continue to use that method in the future. Stella continues to be an amazing milking sheep for us. She is now standing still for milking without even having a halter on. She is just loose in the stall and stands for milking. Such an unexpected blessing! With our illness I haven’t been able to work with the sheep milk, so we are freezing it so I can make stuff with it when I have more time. Eve and Lacy and their chicks are doing very well. All ten survived their first week of life, so that is great. 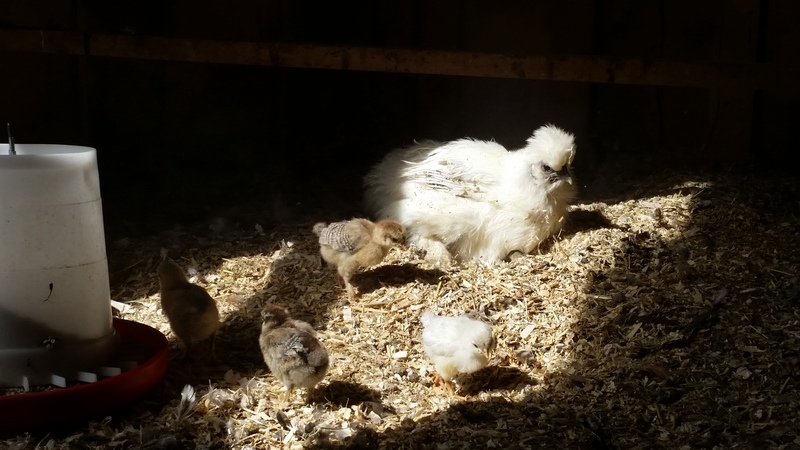 After much discussion and thought, we have decided to end our chicken breeding season this year without an additional incubation. 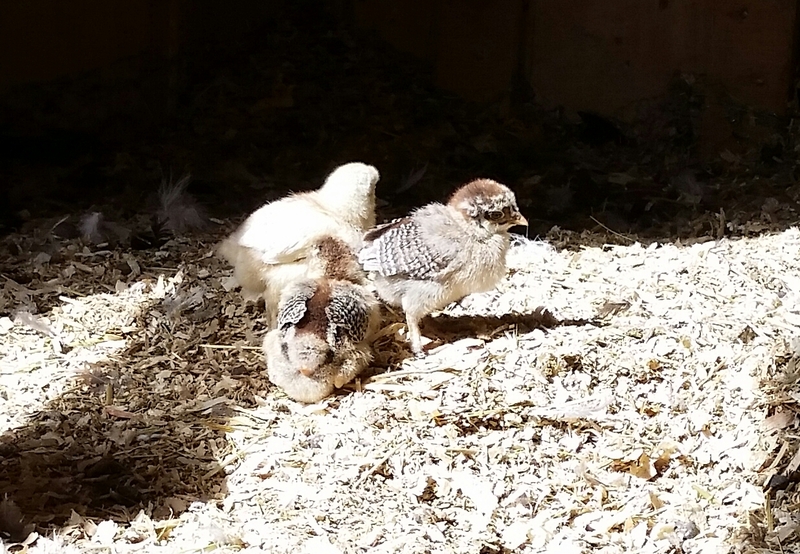 We are in the thick of several huge life changes outside of our little homestead and really don’t have time to juggle raising a brood of chicks at this point. 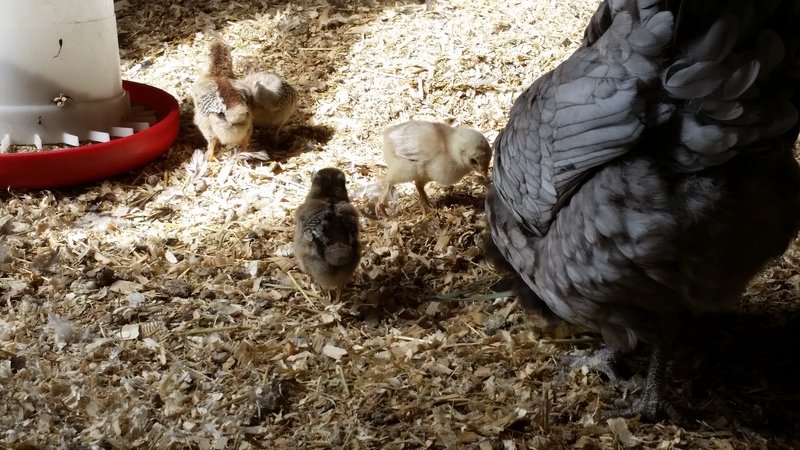 So we are finishing the year with only 17 chicks hatched for the breeding program. Not ideal, but it is what it is. We plan to hit the breeding program hard again in 2016 and catch up from this slower year. 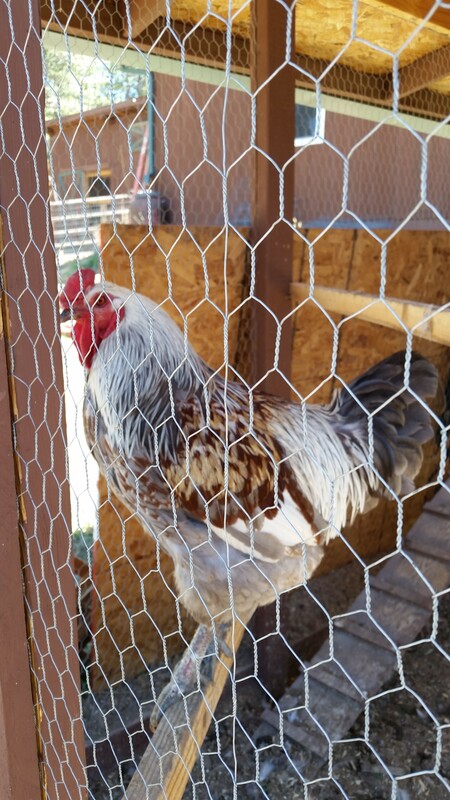 We decided that the rooster that will be kept for next season is Frodo, so Rusty will be headed to the stew pot in the next few weeks. 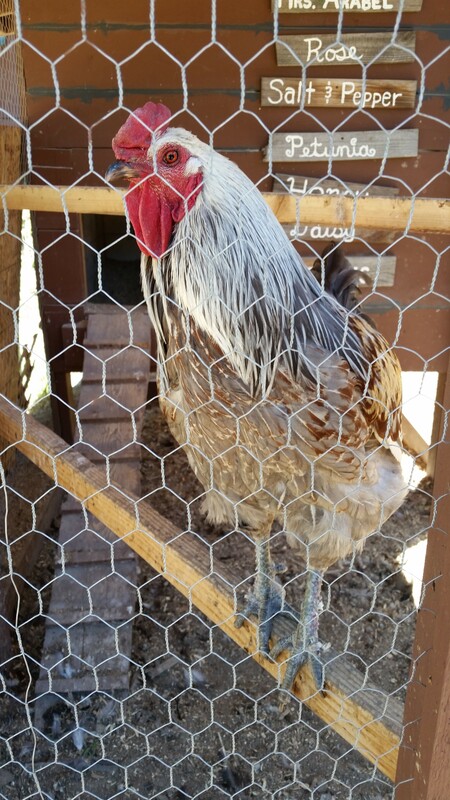 He is a beautiful bird, but Frodo out-scores him in many of the things we are selecting for in our breeding birds. The garden has been put way behind schedule because of the spring blizzard two weeks ago, and then our illness this last week. We are working hard to catch it up and I will do a garden update post later this week. We are hopeful that by next week’s update we will be back on our feet again and enjoying all the fun that there is during spring on a farm! Just about a week after we started milking her, Stella, our purebred Lincoln Longwool, has really hit her stride with the milking process. It seems this girl was made to be a milk sheep – despite the fact that her breed says otherwise. 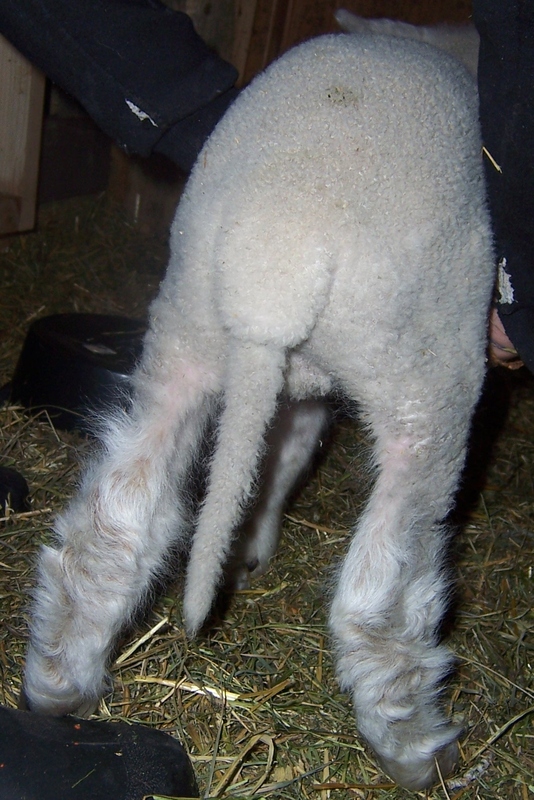 Lincoln Longwools are a wool sheep, known for their dense and strong fleeces. 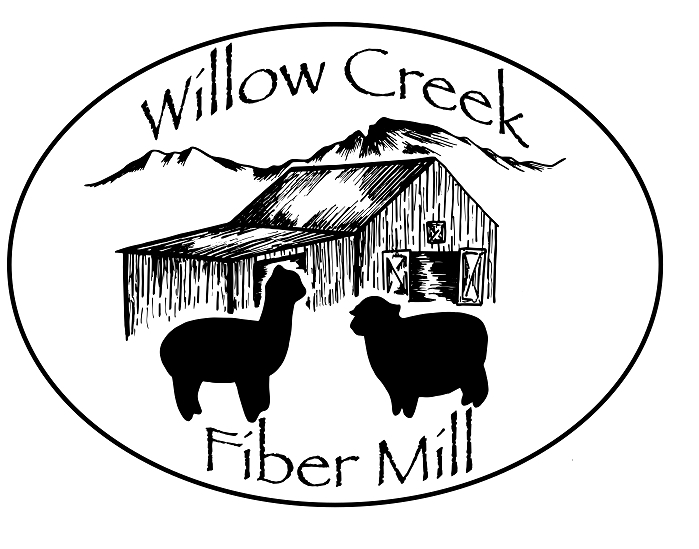 Their wool is excellent on its own for outer garments and rugs, or blended with other wools for weaving. When we originally looked into milking sheep, we found out that dairy ewes are very expensive and not within our reach for the next several years at least. But then we found out that, while they don’t make as much milk, and can often be harder to milk, non-dairy breeds can be milked too. So we started considering the ewes we already owned for potential milk ewes. When we discussed milking our wool ewes, we weren’t even considering Stella at first. She has extra, non-functional teats. This happens a lot on livestock, and generally doesn’t cause a problem, but it isn’t ideal for the udder of an animal used for milking because they can get in the way. Little did we know when we were first planning and examining udders that Stella would end up having such a prolific udder that is actually quite well suited to hand milking. When husband gets to the barn for milking he puts her halter on and gives her feed, and before he even gets her udder washed, she is already letting down her milk. 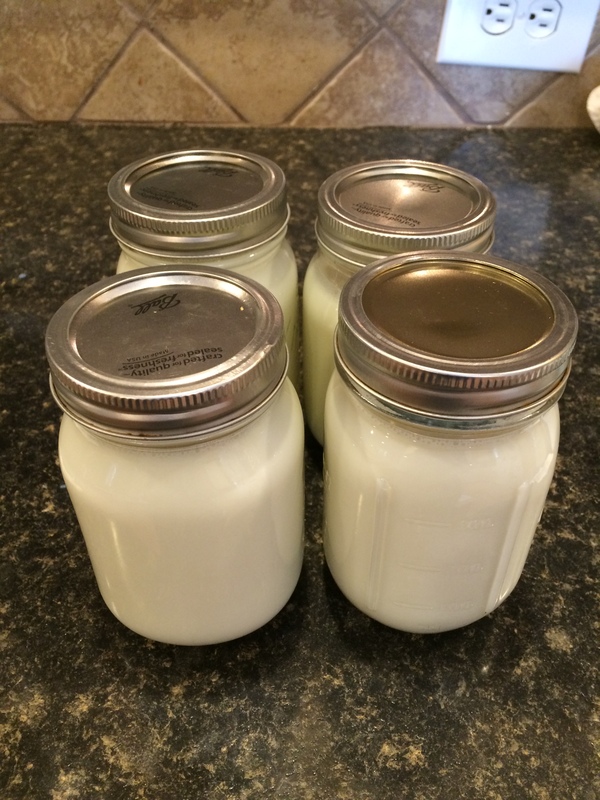 He easily milks out over a pint within about 5 minutes, doing one side at a time while holding the jar…and it’s done. So with a little more than ten minutes of effort we are getting over a quart of sheep’s milk a day by hand! From what I have read, the serious dairy breed ewes can produce twice that amount, but a quart a day from a wool-breed ewe is an excellent amount and we are very happy with it. We are very surprised with the ease of milking Stella. Based on our research, we expected it to be harder to get her to let down and relax, and we expected more fussing and fighting from her. In many ways she is actually easier to milk that our last cow was – as far as temperament goes. We had many a kick from that cow, and plenty of dancing around and fussing pretty regularly. Stella has not kicked, jumped, or been aggressive at all. In the beginning she danced a little bit as she was getting used to it, but now, with only a week’s experience with milking, she is standing totally still like a champ. Our inexperience leads us to wonder if Stella is just an exception to the rule, or if milking non-dairy breeds can actually be quite a successful option for a backyard farmer. As hard as it was to lose little Goober, we are glad that some good has come from it. 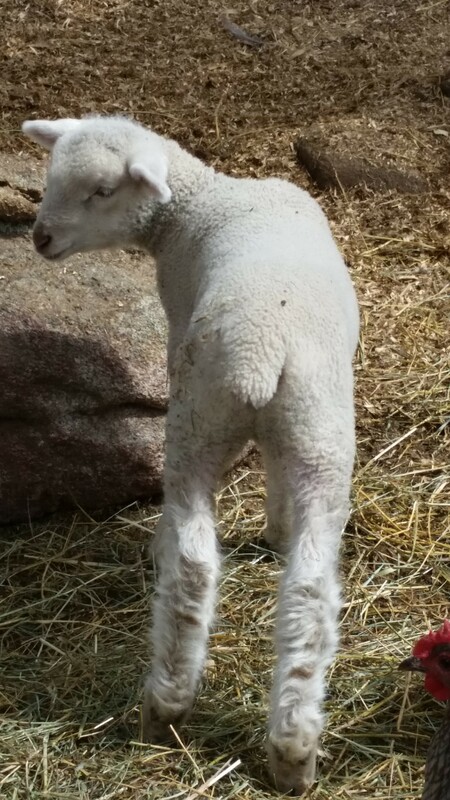 We are very excited about this new adventure on our little backyard farm – milking sheep!